​Without question, 2018 has been a year of enterprise and transformation for the Department of State. As the year ends, it is only appropriate that we reflect on some of its most important achievements. Early in 2018, the Department of State collaborated with 17 other state agencies and more than 100 community organizations to hold eight hurricane-displacement resource fairs across Pennsylvania. The events provided much needed referrals and information to 2,260 individuals and families who relocated here after Hurricane Maria devastated Puerto Rico and parts of the Caribbean in September 2017. In July, the department and the U.S. Election Assistance Commission (EAC) co-hosted a national Election Data Summit in Philadelphia, the first such event co-hosted by a state and the EAC. State and local election officials and election data experts from across the nation met to examine the ways officials are using data to improve election processes and decision making. Also in July, the department hosted the 2018 Summer Conference of the National Association of Secretaries of State (NASS). Our staff helped to organize four days of workshops, meetings and events for NASS members and their families at historic locations in Philadelphia. Pennsylvania last hosted the NASS Conference in 1972 in Hershey. Pennsylvanians continue to embrace online voter registration (OVR). In February, we celebrated our one-millionth online voter registration transaction, and in August we marked OVR's three-year anniversary. During the 2017-2018 school year, 32 high schools across the commonwealth held voter registration initiatives during the first year of the Governor's Civic Engagement Award program. In total, 16 schools qualified for an award by registering at least 65 percent of their eligible students, and nearly 3,000 students registered to vote. We expect the second year of the program to be even more successful. At the Department of State, election security is a priority every single day, not just on election day. From forming an inter-agency election security workgroup to hosting tabletop exercises that mimic real-life cybersecurity threats, the department continuously works with our local, state and federal partners to meet the highest standards of incident planning, preparedness and response. After Pennsylvania's congressional districts were redrawn in February as a result of litigation, the department implemented a thorough and detailed public education campaign for voters through our website and social media platforms. Voters can use our website to explore the new districts by county, district number, and an interactive Google map. Our website includes text descriptions of the new districts, FAQs, and graphics comparing the new map with the 2011 map. We also created a search feature that allows voters to find their congressional, state Senate and state House districts when they check their voter registration status. In April, the department directed counties to select new voting systems that provide a paper record by the end of 2019. Most of the voting machines in use today in Pennsylvania are older than the first iPhone. Their software and hardware soon will be unsupported by manufacturers. The new systems will ensure that Pennsylvanians are voting on the most secure, accessible and auditable equipment available. You can learn more about the benefits of paper records by reading this recent post. We hosted new voting systems expos across the commonwealth to provide county officials, the public and media with the opportunity to learn more about the new systems. The department is working with vendors, the state Legislature and counties to explore financing options and funding, in addition to the federal HAVA grant we received. In late November, Governor Wolf's team signaled his intention to seek state funding for at least half of the county cost to purchase new voting machines. The department and County Commissioners Association of PA will work with the General Assembly to develop specific proposals for state funding and financing that will support the counties' transition to new systems. 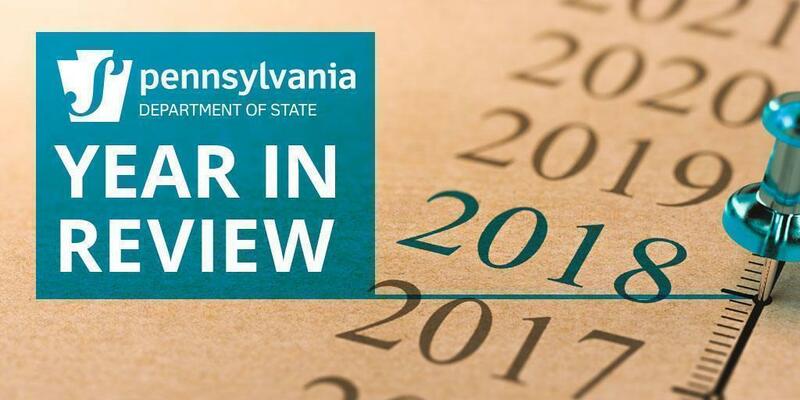 To better serve its licensees, the Bureau of Professional and Occupational Affairs (BPOA) implemented its new Pennsylvania Licensing System (PALS). The system has greatly increased efficiency and cut down on initial licensing and renewal processing times. We continue to improve PALS as we seek feedback from licensees, providers and DOS employees. In July, the department was awarded a three-year State Occupational Licensing Review and Reform grant from the U.S. Department of Labor. We received the grant following the work done on the Governor's executive order to evaluate opportunities for reform in professional licensing. In November, the department received a 2018 Pennsylvania Excellence in Technology Award for work with the state police on an interface that allows professional and occupational license applicants to get a background check automatically as part of their application in the department's PALS system. In 2018, the Bureau of Corporations and Charitable Organizations (BCCO) registered 10,628 charities and 491 professional fundraisers. Over the course of the year, military veterans saved a total of $292,925, as a result of fee exemptions for 2,633 new business filings. The State Athletic Commission (SAC) regulates and monitors professional and amateur boxing, kickboxing, Mixed Martial Arts (MMA) and professional wrestling contests in the commonwealth. In 2018, the commission was named one of the top five athletic commissions in the country, having regulated 37 pro boxing events and 24 MMA events. The SAC sanctioned a record 11 televised events that were broadcast on ShowTime, ESPN, DANZ and Telemundo. The SAC also celebrated some firsts in 2018. It introduced the first state rankings for amateur MMA fighters and opened commission meetings to the public.